Found in The Affluent Society and Other Writings, 1952–1967. New York: The Library of America, 2010. This lengthy quote from an early chapter of John Kenneth Galbraith’s The New Industrial State, suggests not only the major theme of his life’s work, but also one of the central dilemmas of American life. It is with this work, therefore, that I will complete this short series on Galbraith’s writings documenting the affluent generation of American life. 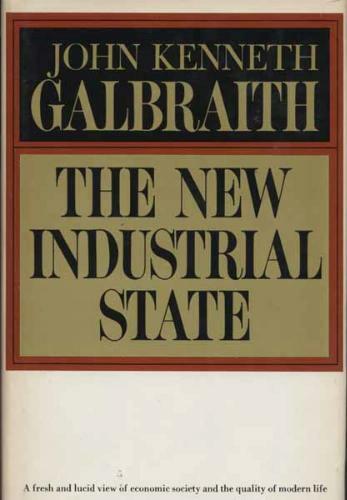 It was conceived after Galbraith wrote The Affluent Society and was largely written down in the early 1960s. But Galbraith was delayed in publication because he was sent as an ambassador to India. This work, like many others he wrote, underwent revisions. Therefore while this was published in 1967, in the Library of America version we read of many facts from the 1970s. This is because the editor (Galbraith’s son) gave us a later edition. This may be useful for those reading this for the most up to date analysis, but may undermine its historical use. Galbraith insists that his major thesis is unchanged. He is simply arguing—in both opposition and in agreement with the central anarchist tenant that that individual must struggle against the institution—that the basic fact of American life is the power of the institution. For those who looked at the Soviet Union in fear of “central planning,” Galbraith points out with ease that the American economy is no less planned. The planning which took place in Soviet Russia in the offices of government bureaucrats, takes place in the American economy in the offices of corporate bureaucrats. (“The enemy of the market is not ideology but the engineer.”) Virtually every aspect of American economic life—employment figures, union vibrancy, markets, production levels, prices, research and development, education and training—is planned. As the historian Alfred Chandler pointed out later, the invisible hand of the market has been replaced with the “visible hand” of the industrial bureaucracy. So much for Adam Smith, the entrepreneur, and free consumer choice. If you want the blow by blow you had only read the book. It is quite convincing, if not obvious to those who pay attention to how our world works (perhaps that is why it is so convincing). I am only amazed that Galbraith was so original in this thesis. This perhaps only shows how powerful the legacy of the free market was in 20th century America. Galbraith coins the term “technostructure” as the modern corporate planning system. An important consequence of this is that those who make the important decisions in the economy are largely invisible. Sure a handful of individual corporate leaders are highlighted in the media, but in most cases their individual influence is entire overstated or exceptional. The entrepreneur disappears into the technostructure. As I see it, a very important part of his argument deals with how individual motivations are transformed by participation in a corporate organization. How is it we all become “organization men”? This was a central fear of the 1950s counter-cultural. This remains a question in an era where increased attention is paid to the problems caused by global capitalism. What is it that makes good people, working for corporations, do such vile thing such as polluting the planet, committing human rights abuses, union busting, or devastating communities? Galbraith’s answer is that the technostructure works to reframe our motivations. As he sees it, one’s motivation is increasingly tied to the motivations of the structure the closer to the center one gets to it. For the rest, there are a massive number of “sub-universes” within the corporate structure that people can align their motivation toward. This is important to keep in mind if we choose to remain committed to individualism over the institution. It is not so easy to thrown off identification with an organization, especially if it is large. In academia, it is easy to see that the student loan system is corrupt or that the administrators may be running the place into the ground, or that a million other things are wrong. Still, a professor may feel their department or their classroom is a space that they identify with. As nice as this is, it does mean accepting their place in the organization. For those of us who are able to stand outside of the corporate organization, for whatever reason, planning is still central to our lives through the technostructure’s manipulation of both specific and aggregate demand. As we have saw in The Affluent Society, in a post-scarcity situation more and more of the production is devoted to meeting manufactured demand. The ones doing that manufacturing are part of the corporate planning apparatus. Well, I reckon people have known this for a while, but have not deserted in great numbers yet. An explanation for the weakening of union power is given in this book as well. Galbraith sees unions are a countervailing power to corporations as described in American Capitalism. We see here that unions played a role of organizing production. They were engaged, in the good old days, in some of the planning. As that role got taken up by the corporate technostructure, unions could either play a vital role in their planning efforts (managing employment, training, or production in their service) or be set aside. In his view, it was not simply the ideological or political assault against unions (he talks nothing about these things), but rather the place of unions in the technostructure itself. What I wondered when reading The New Industrial State was about the location of the countervailing power. Galbraith is not largely concerned with that in this book, but we can assume he holds to his thesis of his earlier work. If every hegemonic economic force (such as a monopoly or oligopoly) nurtures its own enemies, what will rise to challenge the corporate technostructure? Galbraith may not find such an opposition wise. He is not entirely critical of corporate planning. He seems to thinking this planning is necessary for a modern industrial economy. Perhaps he does not explore these forces much because they are potentially quite dangerous. You may be interested in the documentary on economics called “The Age of Uncertainty” written and hosted by Galbraith. I will only post the first episode. 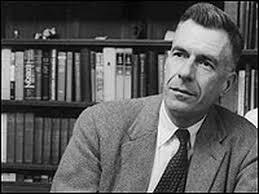 This entry was posted in Capitalism, Class Conflict, Economics, Freedom, History, Individualism, Library of America, Political Thought, Psychology, Technology, The State and tagged capitalism, central planning, corporate planning, freedom, john kenneth galbraith, labor unions, technostructure, the new industrial state. Bookmark the permalink.